We built this IoT prototype as part of ICICI Lombard InsureTech Hackathon for category: Smart cash-transit boxes for theft prevention. This guide showcase working features of prototype. To make it simple, we took a generic tool box and fitted with electronics hardware design to enable it with IoT. All-in-one connectivity: Based on MediaTek MT2502A SoC, offering comprehensive communications and media options, with support for GSM, GPRS, GPS, Bluetooth2.1 and 4.0, SD Cards, and MP3/AAC Audio, as well as Wi-Fi and GNSS (hardwaredependent). Used in this prototype to check whether the device has reached the destination via Haversine Formula and GPS co-ordinates. Also used to track the box in real time and control the door lock accordingly. To check the tampering and door status. 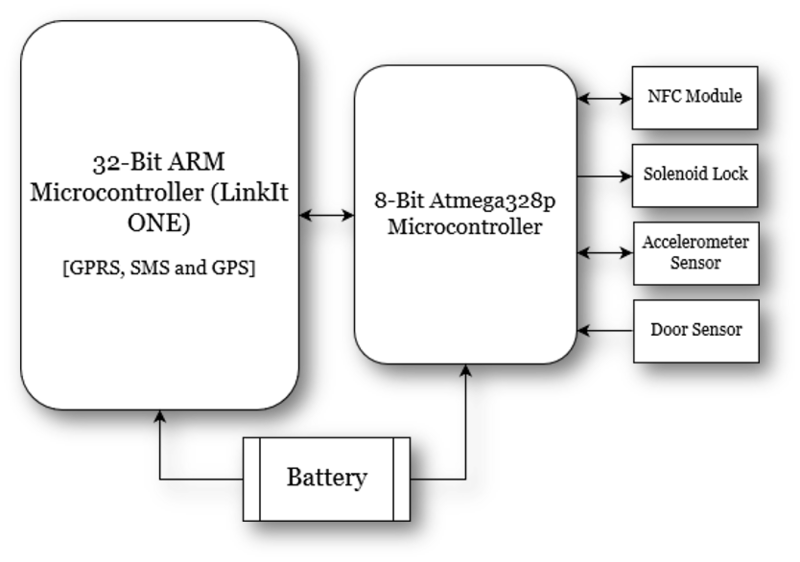 ATmega328p (Arduino Nano): 8-bit microcontroller for controlling the solenoid lock, to check tampering andcheck the door status. It is connected to the LinkIt ONE via serially. Solenoid door: Lock with a MOSFET control circuit Placed inside the device and can be only opened via the authorized NFC card. LIS3DH accelerometer: To detect tampering so as to notify the authorities. Magnetic door sensor: To detect the door status so as to notify the authorities. 12V battery: To control the solenoid lock and 3.7V Lithium ion battery for powering the electronics. It powers real-time communication for this Internet of Things device and is used due to their secure global Data Stream Network. 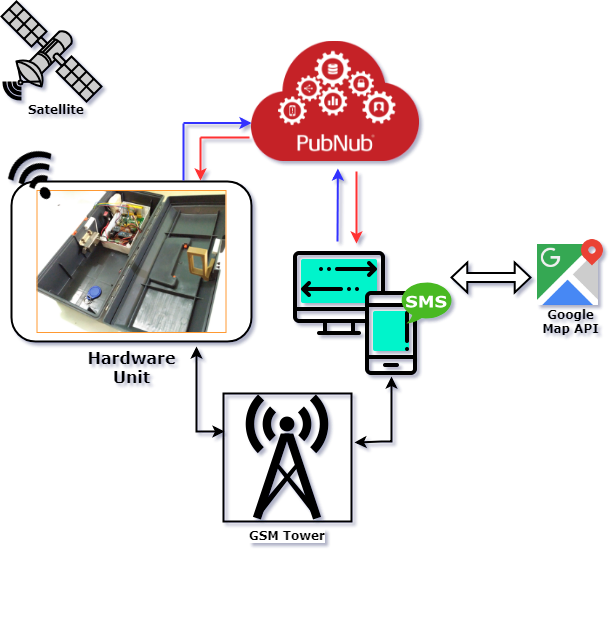 It provides the infrastructure and APIs for communication for any size IoT deployment. Helps to establish bi-directional communication i.e. Send and receive data between devices. Can be used to build Mobile apps with HTML, CSS & JS. Target multiple platforms with one code base Free and open source. We used it to built a WebApp(for windows and mac) and android app for the demo. Service used to show pinpoint location of cash box and selected ATM machine location on Maps. Lock socket is design using Fusion 360 and 3d printed. Arrangement made such that extension of solenoid passes from socket making box locked from inside only. 3d STL file is available in below cad section. Accelerometer used for tampering detection so that if someone tries to tamper with the cash box the necessary authority would be notified via GPRS if internet is working or via SMS if internet is too slow. Solenoid door lock is controlled using the NFC tags and the door status is uploaded in real time. The door can be opened only when the cash transit box is at the receiver location which can be entered into the MCU via the application at the start of the journey. Battery level is notified in real time and the authorities can check it via the app over cloud server remotely. Also the door lock can be opened via the app using the authorized code. Also in real time the authorities can track the cash box remotely and have geofence set so that they can be notified via notifications or SMS if the device moves out of the geofence.